Grade student work anywhere, anytime. Independent studies have shown that educators experience up to a 75% productivity gain using Crowdmark. Students love Crowdmark because they can submit assignments and receive grades on their mobile phone. Students receive richer feedback, faster. Crowdmark has drastically improved turnover time for midterm marking, so I have more time for my own work. What used to take an entire weekend to mark now takes an afternoon, and marking quality has not declined. In fact, I think Crowdmark's comment feature encourages markers to provide useful feedback because explanations of frequent errors can be copied and pasted rather than written out each time. In a very short time it has become an integral part of my courses. I shudder at the thought of being tethered to physical papers again. I concede my bias here as one of my classes has an initial enrolment of 950! I can confidently say my students…have really appreciated its [positive] impact on their learning. I found Crowdmark to be a great help in getting my grading done quickly and in an anonymous manner. I was able to log on from all three of my work locations and avoid toting about 1,000 pages of final exams about. My students appreciated receiving their grades earlier than they would have otherwise. I hope to use it again this fall. Whether your class is large or small Crowdmark is proven to save you valuable time that could be better spent on teaching and research. 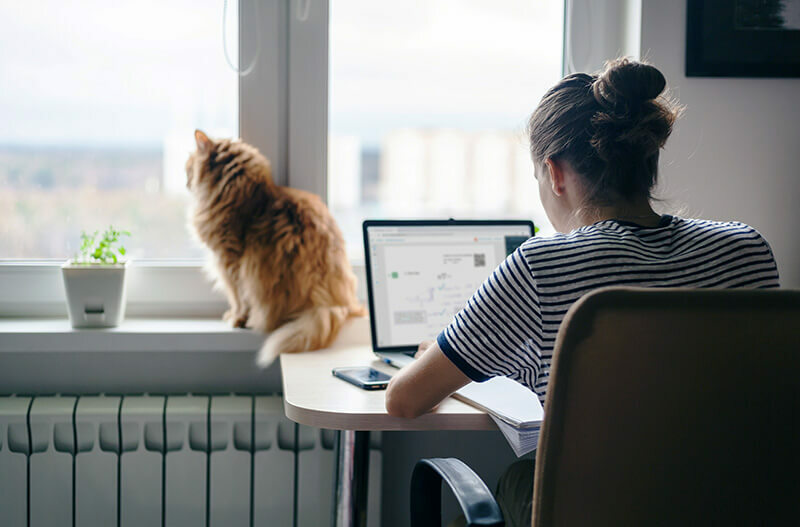 Our streamlined workflow provides efficiency gains in exam administration, grading, data recording and analysis, returning exams and handling regrade requests. Crowdmark provides data visualizations of student performance on each question. Analysis of this data leads to improved student learning outcomes and generates insights into academic program performance. Our platform and grading workflow support academic integrity by ensuring there are no edits made to exams after they are returned to students. Once an exam is written it is uploaded to Crowdmark for grading and saved as an image. This definitive version of the exam is frozen in time and cannot be edited by the student after the exam. Grade anywhere, anytime. 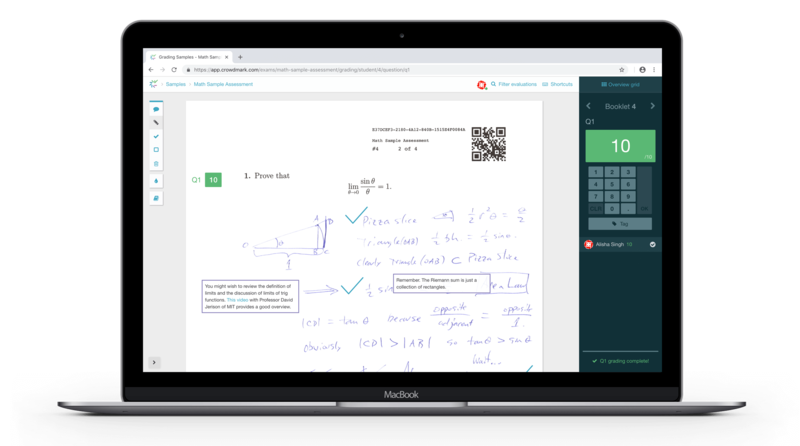 With Crowdmark educators can grade assessments with ease using any Internet connected device from anywhere. Paper, paper and more paper. Educators are forced to carry stacks of paper or organize a grading session at a pre-arranged location at a pre-arranged time and do the ‘paper shuffle’. Graders collaborate with ease and grade assessments on a question-by-question basis seeing results and each other’s comments in real time. Different pages within an assessment can be graded at the same time. Collaboration requires significant logistical planning. Graders must trade piles of paper assessments back and forth. Paper stacks must be transported home and back to the institution or from a storage facility to a secure room. Graders provide rich feedback with scores, graphical annotations, hypertext comments and mathematical notations. Frequent comments can be added quickly using copy and paste. Graders provide comments and a number score using a red pen. Frequent comments need to copied in pen again and again in the page margins. Scores are automatically calculated and easily exported. Any errors are easily identified by one click and updated in the system. Scores are added and recorded manually using data entry. Errors are easy to make and cumbersome to remedy. Results are emailed to students with one click. Assessments can be returned with rich feedback within hours. Papers are distributed manually in class. More paper shuffling and significantly more time required. Crowdmark can be licensed by individual departments, across faculties or university wide.